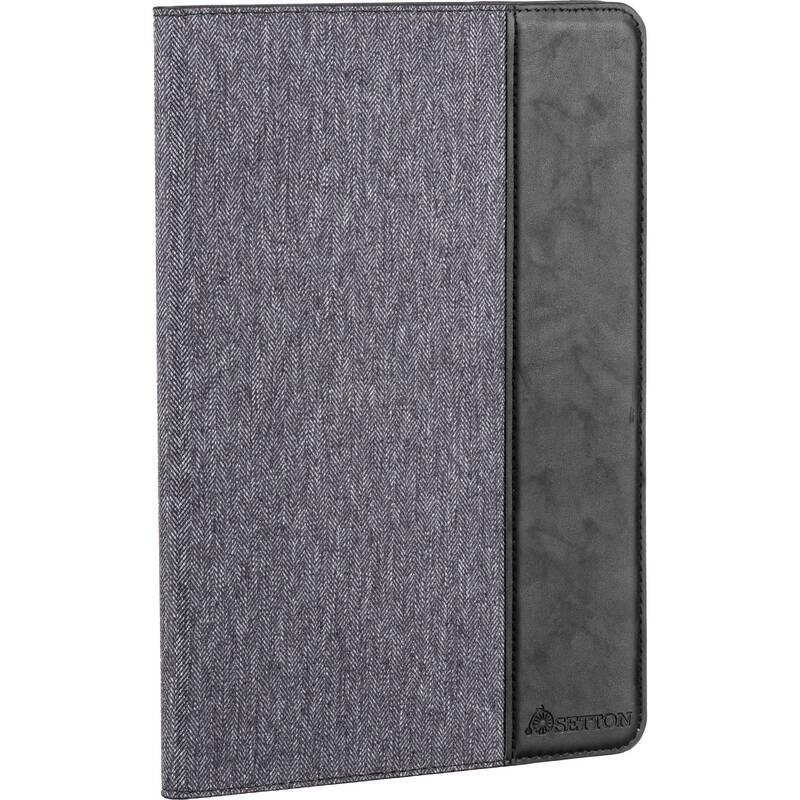 Give your Apple 9.7" iPad Pro an executive look with a vintage touch with this gray and black Case Ultra Slim with Smart Cover from Setton Brothers. Made of cotton fabric on the exterior, hard-shell polycarbonate for a case, and rubber/textile on the inside of the cover, this Setton case protects your iPad Pro and gives it a unique look. It closes magnetically and also supports the auto-sleep and auto-wake functions when you close and open the cover. You can also use the cover for multiple typing and viewing angles. The Setton case is compatible with the Apple 9.7" iPad Pro. The Setton case is crafted with cotton fabric, which allows you to carry your Apple 9.7" iPad Pro in a sleek design with a vintage touch. The hard-shell polycarbonate case protects the back of your iPad Pro with precise cutouts. The flexible rubber/textile protects your display. The case allows you prop up the iPad Pro into multiple typing positions and viewing angles. With built-in magnets, your iPad Pro can wake and sleep when you open and close the case. Box Dimensions (LxWxH) 10.0 x 7.0 x 1.0"
Case Ultra Slim with Smart Cover for Apple 9.7" iPad Pro (Gray/Black) is rated 2.1 out of 5 by 20. Rated 1 out of 5 by Peter from Terrible product I buy a lot of stuff from B&H and this is by far, the worst thing I’ve ever bought. It was on the Holiday mega sale for under $5 and even at that it was not worth the money. It’s not practical to return, so it goes to charity, in the original packaging. It is cheap, flimsy and offers no protection for your iPad. I should have know better at that price! If I was not a devoted B&H fan and this was my first B&H Purchase, it would put me off ever shopping at B&H. I find it hard to believe that a B&H product manager ever actually looked at this item, to allow it to be sold on their site. Rated 1 out of 5 by David from Buyer beware - badly made and does not fit all 9.7 ipads This does not fit all ipads that are 9.7 For example, it does not fit my model A1822. The profile is correct it it seems like it should fit, but the ipad will not snap in securely. Also many of the cutouts for buttons and camera do not line up. Unusable. Maybe it is for a different model, or maybe it is just a bad design. Rated 1 out of 5 by Yukan from Wrong product info (well, secretly corrected) Ordered it because of the great price and website stated its for iPad, received in a few days (thanks for fast shipping), could not fit my brand new iPad, went back to the website and surprisingly found out description had been corrected to fit iPad Pro only. So basically I spent some money and time and received a piece of useless thing, go figure. Rated 3 out of 5 by Yue from The quality is pretty good, be aware its for iPad Pro only I received it and like the quality. But it doesnt fit my iPad 9.7 2018. I know that sounds silly, but I think B&H should improve the title. When I shop on my phone I see Setton Brothers Case Ultra Slim with Smart Cover for Apple 9.7 iPad, other parts of the name is been chopped. Its in deal-zone so I didnt check the detail (which does mention its for 9.7 iPad Pro). Just a bit of feedback. Rated 3 out of 5 by Gregory from Nice but.... Same fit problem with my new $300 iPad as other customers stated, but I noticed the original B&H listing only said the case was for an iPad. Later their description was changed to iPad Pro! So it seems they realized their mistake. Anyway, they case is very attractive and high quality, but unfortunately wont work for me. Rated 5 out of 5 by Roy from Very classy and functional at the same time. This case looks great with the leather and cloth exterior finish. Great protection for the iPad. The only down side is the rubber like material used on the inside of the lid. Protects well but leaves an oily film on screen that you will need to wipe off with a microfiber cloth or cleaner and a regular cloth. Rated 1 out of 5 by Betty from Defective from the manufacturer Manufacturers’ Quality problem with this item. The plastic part of this case is bowed causing the IPad not to fit snugly. Only a problem with the Black case so far, the plaid case appears to fit perfectly. Rated 1 out of 5 by Christian from Dont waste your money. You get what you pay for with this cover. The problem is the iPad didnt fit in the case. When I pushed one corner, another one would come out. I finally gave up and went on-line to buy a better cover. it's fit with ipadair 2? does this case fit for ipad 9.7&quot; 2018 version? I just bought one, it DOES NOT FIT!!! !